The roll-out means thousands more Wandsworth residents now have a low cost, pay-as-you-go hire car within a short walk of their home. The total number of on-street car club bays now stands at 90 and will rise to 150 over the coming months. The council first introduced on-street hire cars in 2007. Since then the number of local people using the scheme has rocketed and is now among the highest in London. Independent research shows that, on average, one car club vehicle results in a reduction of 20 privately owned cars in the local area. Expanding car clubs is a key priority for the council’s Travel Choices campaign which aims to give residents new and improved transport options. Other objectives include increasing capacity on rail routes, bringing the Barclays Cycle Hire Scheme to the borough and extending the Northern Line to Battersea. "Wandsworth is already the car club capital of south London and these new bays will bring the schemes within easy reach of more local people. Car clubs have proved extremely popular in Wandsworth and we will continue to do all we can to encourage further expansion. The new on-street car club spaces are being managed by three different car club operators - Zipcar (formerly Streetcar), City Car Club and Greenwheels. Each operator offers cars on a pay-as-you-go basis which can be picked up from a local bay used for as little as one hour at a time before being returned to the same spot. The cars can be booked on-line or over the phone. 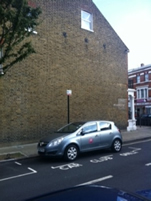 As well as on-street car club bays there are 117 car club vehicles available for people to use in Wandsworth which are parked on private property.